This year, Magnum Photos will celebrate 70 years of contribution to photography with the launch of a global public events, exhibition and new content programme. Centred on the three themes of community, witnessing history and Magnum Photos Now, the special anniversary programme will explore the institution and photographer personalities of then and now, central to past and current visual culture. Throughout the year, the website will feature defining images and visual stories from the past seven decades of Magnum including founding member Robert Capa’s iconic documentation of the D.Day landings in Omaha Beach, 1944, Henri Cartier-Bresson’s 1947 record of the independence of India and Stuart Franklin’s first-hand account of the Tiananmen Square uprising in 1989. Magnum photographers will also take on an ambitious new visual project, Magnum Retold, to mark the occasion. This will see Magnum’s contemporary photographers reshoot some of the agency’s most seminal stories, reworked to reflect the changing world we live in today. Click through / scroll down for a list of key events. In 1947 four photographers, Robert Capa, Henri Cartier-Bresson, George Rodger and David "Chim" Seymour, toasted the founding of what would become the world’s most influential artist collective over a celebratory magnum of champagne in the Museum of Modern Art, New York City. In the past 70 years, 92 photographers have contributed to the story of Magnum and today, 49 photographer members continue to chronicle the world, interpreting its people, events and issues through visual storytelling. Centred on the three themes of community, witnessing history and Magnum Photos Now, the special anniversary programme will explore the institution and photographer personalities of then and now, central to past and current visual culture. Public events across New York, London, Paris and in Asia will give people the opportunity to get closer to Magnum at 70 and its evolution into a forward-thinking media brand. Through engagement with its archival and contemporary work, Magnum Photos is committed to connecting more people to the importance of the image and the need to continue telling the world’s most important stories. 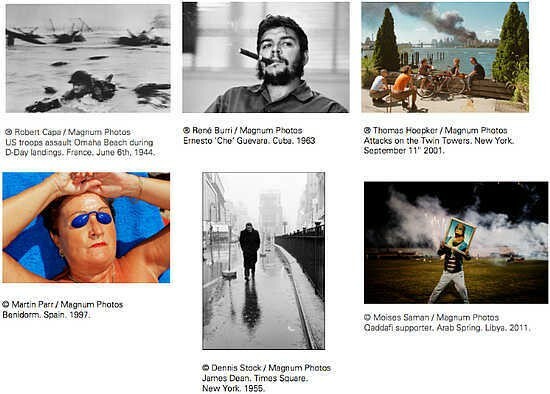 Throughout the year, the site will feature defining images and visual stories from the past seven decades of Magnum including founding member Robert Capa’s iconic documentation of the D.Day landings in Omaha Beach, 1944, Henri Cartier-Bresson’s 1947 record of the independence of India and Stuart Franklin’s first hand account of the Tiananmen Square uprising in 1989. Magnum photographers will also take on an ambitious new visual project, Magnum Retold, to mark the occasion. This will see Magnum’s contemporary photographers reshoot some of the agency’s most seminal stories, reworked to reflect the changing world we live in today. Monthly talks programme in collaboration with MKII, Paris. National Arts Club, New York – exhibition of classic Magnum photographs taken in New York in the 1950s. An official anniversary exhibition curated by Clément Chéroux, opening at the International Centre of Photography (ICP), New York, followed by an international tour. An accompanying book published by Thames & Hudson will be released on 25 May 2017. Examining the legacy of two of Magnum’s co-founders Robert Capa and George Rodger.